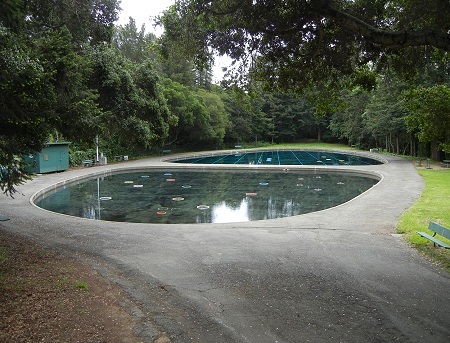 One of Oakland’s most beautiful places is tucked in the woods next to the Warren Freeway at Carson Street: the casting pond complex of McCrea Memorial Park, along Lion Creek. Entering the park took my breath away the first time I visited. Lion Creek leaves the grounds of Holy Names University and runs in a steep gorge behind Elinora Avenue, evading the freeway for a short stretch that includes the park. 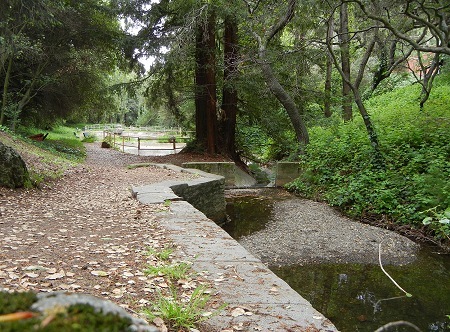 Sulfur Mine creek joins it at the south end, and the combined stream enters a culvert beneath the freeway, where Horseshoe Creek joins it, and runs to the Mills College campus. This part of the streambed is highly engineered. The 1947 topo map shows an ordinary stream valley here with an intermittent stream indicated, so the wide glade for the ponds was built and the stream shunted aside. Farther downstream are some empty ponds whose purpose I don’t know; perhaps one of you does. The woods have made the area their own. This was once part of Leona Heights Park, which was cut in half by the freeway, and a pedestrian bridge that may be Oakland’s least-used one connects the two sides. This entry was posted on 26 June 2014 at 9:48 pm and is filed under Oakland streams and water. You can follow any responses to this entry through the RSS 2.0 feed. You can skip to the end and leave a response. Pinging is currently not allowed. The park’s web link you included above shows a picture of an unused trout pond that looks like the pond whose use you were unsure of. The park seems to be a nice little oasis. Trout ponds (2) now empty and in disrepair were regularly stocked with rainbow trout from 1950’s though most of the 1970’s. Claud was the City’s caretaker who lived on the grounds in the little red house (still there). Was my first job. In about 1967. I grew up on Elinora Ave from 1958 to 1978.